A quality workspace environment plays a major role in boosting productivity and business performance. Numerous leading research studies confirm that company’s workspace environment greatly affects its bottom line - employees’ creativity, innovativeness, volume of output, as well as their health and overall engagement. If you share our view that your people are one of your greatest assets, Studio 2 is the right partner for you. Regardless of whether you are considering moving offices, refurbishing or just rethinking how to use your space, this change - if done correctly - can have a profound impact on your company’s business performance. It is quite easy to lose track of the bigger picture and build a workspace environment around recent office trends, fresh interior design and hip furniture. 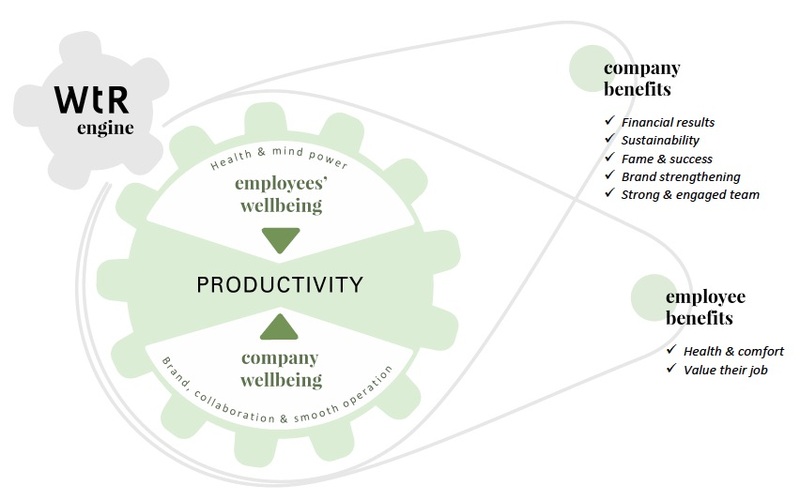 In contrast, we focus deeply on what we call “employee wellbeing” (healthy and undisturbed body and mind) and “company wellbeing” (brand, efficient collaboration, smooth operations etc.). As your partner, we make sure to cover all the aspects important for your company and employees to boost productivity in your workspace. From an initial concept to the architectural drawings and detail specification, we create your new workspace design. Our creative process is informed by both insights about your company collected during the initial stage and our deep and continuously evolving knowledge of productive working environments. We observe, ask and listen to make sure we have a solid understanding of your employees, processes and company culture before we start forming the new concept. We take all of these inputs to advice you on how to structure and design your office to raise productivity and deliver transformational results. We tailor our approach depending on the size of your company and your needs. Every company is different and if it wants to succeed in the highly competitive environment, no one-size-fits-all solution is acceptable. As part of our design process or as a stand-alone service, we help you to understand what exactly could be improved in your working environment to create a productive workspace and optimize your office. We offer complex services in interiors from structuring the space to creating its final look and feel. We cooperate with multiple brands to tailor the design to your company culture and needs. We do architectural drawings, floorplans as well as custom furniture design. We are a cross-functional team of interior architects, designers, researchers, consultants and 3D-artists (see Studio 1) who combine our expertise to maximize the value of your workspace, show it and deliver it. Read more about our team here.